The long-standing issue of the Scottish independence is to be settled by a referendum scheduled for September 18, when voters will be asked one question only, "Should Scotland become an independent country?" If the majority of Scots vote for independence, then on March 24, 2016 Scotland will secede from the United Kingdom. According to Scotland's latest poll, conducted by Survation, "No" voters who oppose Scottish independence from the UK are six points ahead of "Yes" voters who wish to see their country split from England and Northern Ireland. Late September 18, as polls began to reveal the narrow victory of the ‘No’ vote in the Scottish referendum, Mr. David Coburn, a UK Independence Party Member of the European Parliament representing Scotland told Radio VR that the Scots, in fact, were never offered true independence. Instead, he claims, they were merely being offered the option of being ruled from Brussels rather than Westminster. With all ballots counted, Scotland has chosen to stay in the United Kingdom with 44.7 percent in support of independence and 55.3 percent rejecting it. The final declaration for Highland region, the last of 32 Councils to declare, has been delayed following an accident on a major trunk road that has held up police vehicles transporting ballot boxes to the regional count in Inverness, according to RIA Novosti source. J.K. Rowling, author of the Harry Potter series of novels, who believes Scotland would be better off staying part of the United Kingdom, closely followed the Scottish referendum and called it peaceful and democratic on Friday, noting that the Scottish had a reason to be proud of it. The Prime Minister of the United Kingdom David Cameron congratulated in his Twitter the leader of the Better Together campaign Alistair Darling with a well-fought campaign. The leader of the pro-Scottish independence campaign, Alex Salmond, has conceded defeat in a historic referendum and expressed his doubts as to whether Scotland would be able to go back to 'business as usual' in politics. With vote count over in 31 out of 32 Scottish regions early Friday, Scotland is projected to reject independence by a substantial margin of nearly ten percent. The council region of Edinburgh has finished voting in the Scottish independence referendum, with 61.1 percent having voted against secession from the United Kingdom, and 38.9 percent having voted for it. With 26 out of 32 Scottish council areas having finished voting in the independence referendum, 45.7 percent of Scots are in favor of separating from the United Kingdom, while 54.3 percent are against. North Lanarkshire has voted to become independent from the United Kingdom, with 51.1 percent of "yes" votes against 48.9 percent of "no" votes. Scotland's biggest city, Glasgow, has opted for Scottish independence, according to the council area’s referendum results, released early Friday. The Scottish city of Aberdeen, which is one of the nation's big three, has been a very hefty win for the "no" campaign in the referendum, astonishing many analysts who expected it to support Scotland's bid for independence. 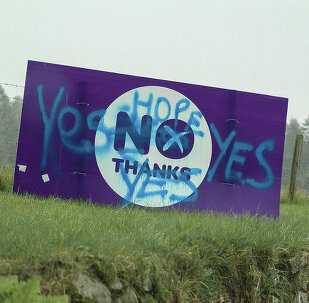 Scotland's Stirling council area said "No" to Scottish independence, the official results released early Friday showed. Scots in the council area of West Dunbartonshire have been the second to say a resounding “yes” to Scottish independence, with 54 percent supporting Scotland’s secession from the 307-year-old union, according to the newest results. The Inverclyde council area, located in the west central Lowlands, has voted ‘No’ to Scottish independence, according to the reports released early Friday. The Western Isles of the west coast of mainland Scotland have delivered a "no" vote in the Scottish referendum, according to the returns released early Friday. Scotland’s Shetland voted against leaving the United Kingdom, shows the council area’s results released in the early hours of Friday. In Glasgow, the turnout in Thursday’s Scottish independence referendum was only 75 percent, which is lower than was expected. Scotland's island council area of Orkney has become the second to say "no" to Scottish independence, the official results showed according to the Council Region of Orkney. The leader of the UK Labour Party, Ed Miliband, said in the early hours of Friday the Scottish independence referendum has taught the rest of the UK a "lesson in democracy".